Fact: even unicorns have to poop, just like you and me. Well, kind of! Say hello to Unicorn. She has a beautiful silky-smooth mane, a glittery horn that sparkles in the sunlight and perfect pink hooves that shine as she gallops. She’s basically just like every other unicorn out there. Except for her rainbow poop, of course. Wait – haven’t you heard about her rainbow poop? Everyone’s heard of it, haven’t they? 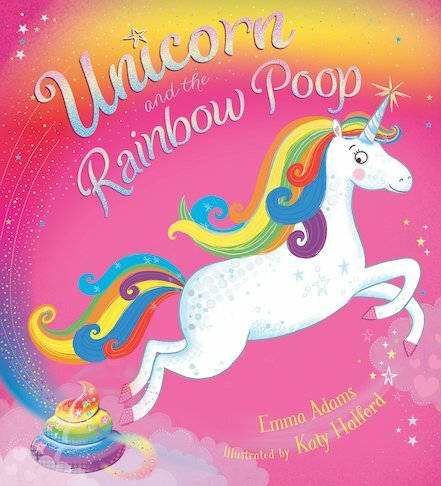 Read all about it in this fabulously funny picture book, bursting with unicorns, dragons, princesses, fairies, mischief – and sparkly poop! Hurray! All the fun of The Dinosaur That Pooped – with unicorns! AD650L Lexiles are the global standard in reading assessment. They are unique as they are able to measure a child and a book on the same scale – ensuring the right book gets to the right child at the right time.